The table is crammed with bottles of oil and fat bunches of herbs. In the corner, steam pours out of a large wooden tub. Meanwhile, my therapist’s hands work the oils into my skin, loosening knotted muscles. Here, thousands of years of practice have perfected the art of relaxation. Ayurvedic treatments like the one I’m having form part of an ancient system of therapies designed to heal and rejuvenate. It’s a symphony for the senses, but it’s just a hint of what is to come. Because in Sri Lanka, you don’t simply see the sights: there is so much to smell, taste, hear and feel, too. From wafting incense and rhythmic drumming in ornate Buddhist temples, to the cacophony of tuk-tuk horns that accompanies your coconut-flavoured ‘hopper’ crêpe at a street-food stall, a holiday here will thrill in every way. The teardrop-shaped island packs its many highlights into an area a quarter of the size of the UK, and navigating it needn’t be stressful. Flight Centre Journeys include a driver guide, who will be as attentive or discreet as you wish: ready with insider knowledge when you need it, but equally happy to let you wind the window down and watch the world go by. 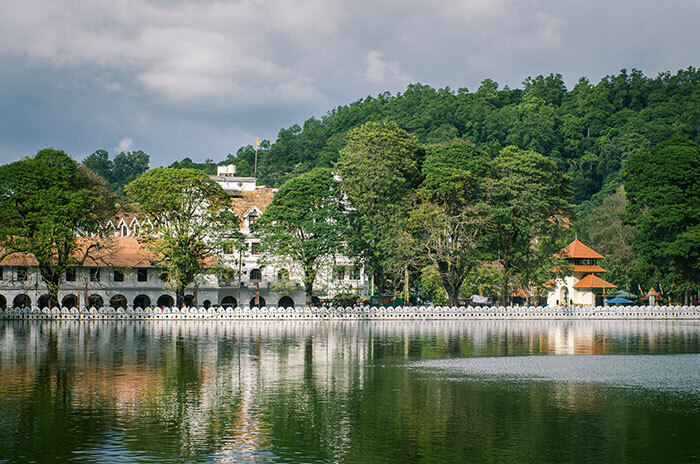 After my massage, I step blissed out and blinking into the heart of Kandy – the ancient city at the centre of the island. The weather here in hill country can change on a dime, with captivating mists often swirling across Kandy Lake. On its shore, the Temple of the Sacred Tooth Relic is one of Sri Lanka’s most important Buddhist sites. Time your visit to coincide with evening prayers and you’re welcome to mingle with the worshippers who have come to make offerings of lotus flowers. Drummers flank the entrance, and the pulsing rhythm propels you past colourful murals and golden statues. I end my day at a traditional Kandyan dance performance, where the elaborate costumes are as loud as the drums, and the dancers’ bell-studded anklets create a rippling counterpoint to the beat. Not far from Kandy, in the leafy shade of the New Ranweli Spice Garden, you can learn all you need to know about the herbs used in soothing massages and revitalising treatments. Wandering the paths with a guide, I find out about the active ingredients in the oils and balms, and the spices that make Sri Lankan food so flavourful. Cardamom, cloves and nutmeg all grow here, along with pepper that can be hotter than chilli. The hill country’s climate isn’t suited only to spices, however. South of Kandy, Nuwara Eliya is Sri Lanka’s capital of tea. 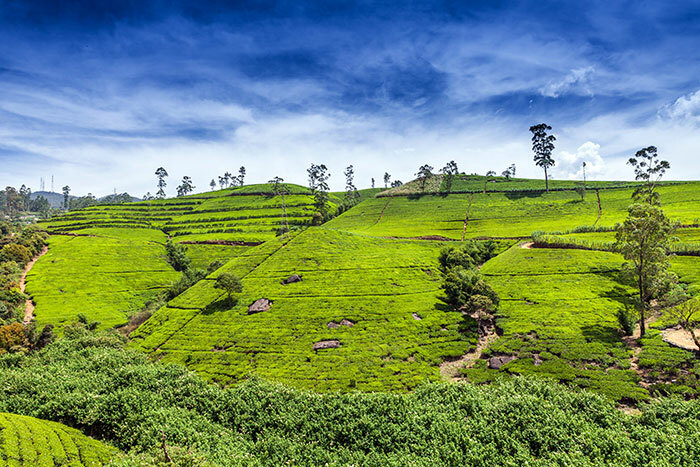 I ride the train past tumbling waterfalls and terraced tea plantations to the hill station, where colonial-style houses and manicured rose gardens make you feel as if you’re stepping into an idyllic English village. In the tea factories, Victorian machinery clatters and hums. North of Kandy, the landscape shifts gear. Gone are the rolling hills, replaced by something flatter, hotter and dryer. This region, where one of Sri Lanka’s earliest cultures thrived, is marked by dramatic ruined cities and towering rock outcrops. 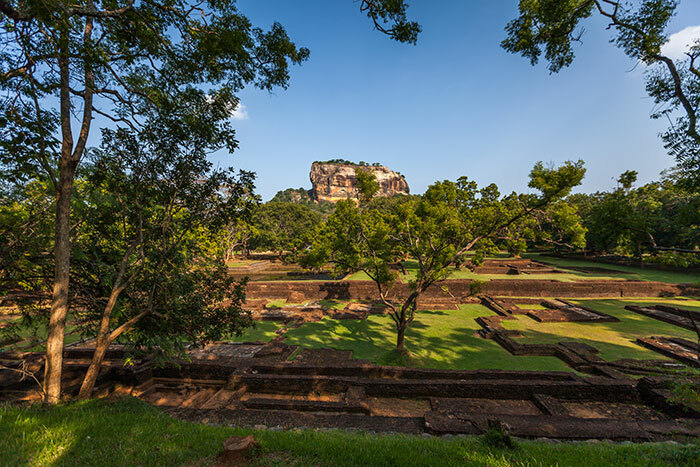 Sigiriya is one of these rocks, where the sprawling remains of a 1,500-year-old fortress perch 200m up. Constructed by a flamboyant king who usurped his brother to claim the throne, the fortress is reached by vertiginous steps cut into the near-vertical walls. It will cost you half an hour of panting and some pain in your quads, but it’s a pittance to pay for the views from the top. 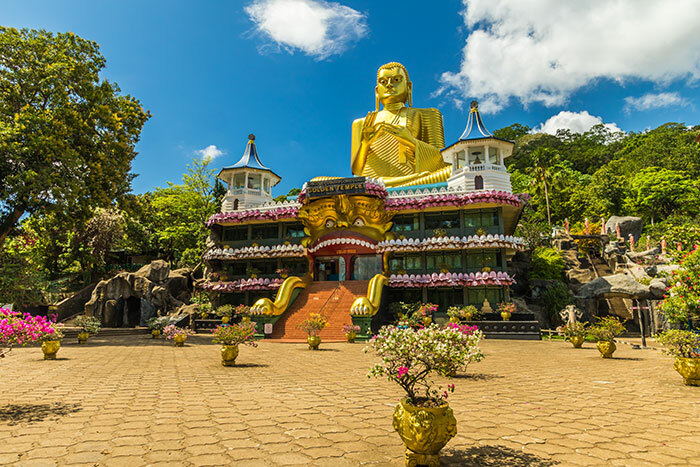 From here, the next stop is Dambulla, where we slip off our shoes and step inside the cool cave temples. As our eyes adjust to the dimness, intricate statues are revealed, along with rainbow-coloured frescoes that cover every square inch of the five caves. Venturing to the coast, you realise that Sri Lanka is an emerald set in gold. Surrounding its lush interior are hundreds of miles of sandy beach, just waiting for you to sink your toes in. 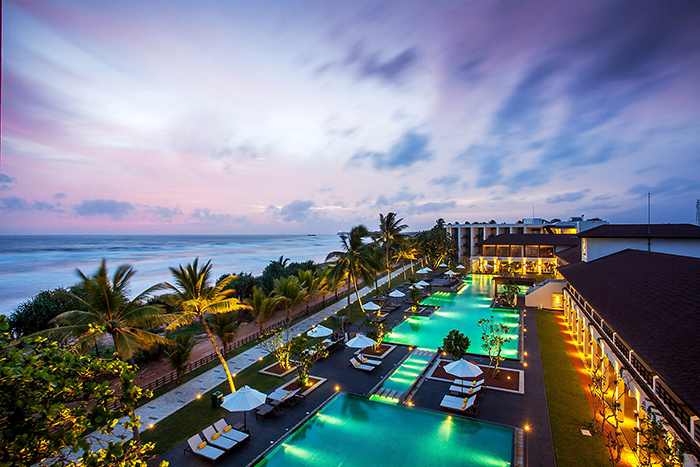 It’s tempting to check in to one of the luxurious coastal hotels – perhaps the Centara Ceysands Resort & Spa, with its unparalleled setting between palm-lined ocean and mangrove-fringed river – and let the sea breezes bring the sounds and scents of Sri Lanka to you. But the coastal regions have other thrills to discover too, from the sophistication of southern city Galle – where you wander the narrow lanes between Dutch colonial mansions to discover chic boutiques and cafés – to the wilds of Yala National Park. Here you can safari Sri Lankan-style, spotting leopards, elephants, water buffalo and sloth bears, with a constant commentary from the squawking parrots and chattering monkeys in the treetops. Yet more incredible wildlife awaits off the south coast, where blue whales come closer to the shore than anywhere else in the world – particularly from December to March. As their vast bodies breach the water, the sound of the spray from their blowholes is thunderous. Choose from our range of Sri Lanka holidays or chat to a Travel Expert about tailor making your own trip to this incredible isle.